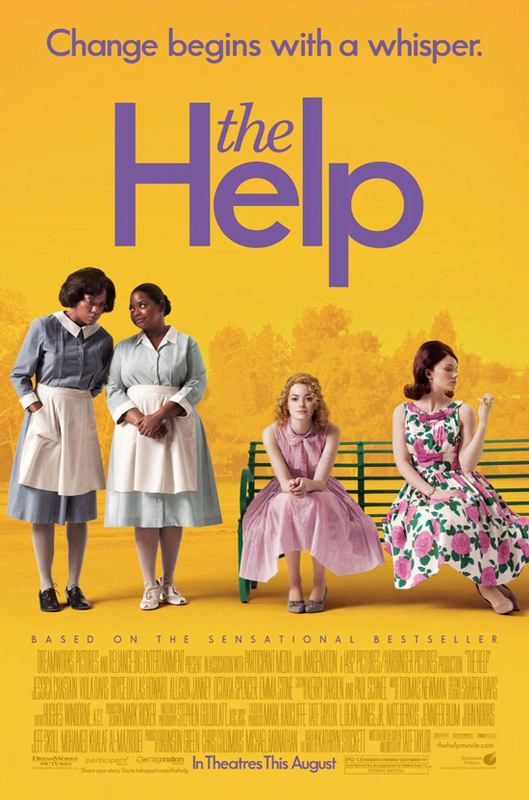 As my regulars know, I rather avoided reading The Help (linked to my review) at first because it was one of those "fad" books. Everyone was reading it so, naturally, I didn't want to. I like to let books simmer for awhile. But then, if you'll recall, my mom read it and said she loved it and so I went ahead and read it. I sure was glad I did! I discovered when I was writing up my book review that they were making a movie out of it. Apparently I read the book just in time! As any good reader knows, when Hollywood gets a hold of a book they delight in ruining the story. They get a pleasure trip in totally spoiling the work of a good story teller. I am happy though that apparently they thought well enough of Kathryn Stockett's original efforts that they left the basic storyline virtually untouched! The movie was absolutely fantastic. There is some cursing in the movie, most of which takes place during the first 20 minutes and involves Skeeter's managing editor. Otherwise, the movie was as clean as a whistle. The opening scene with Mae Mobley ("You is kind.") moved me into the story instantly and I enjoyed every single second of it. (Regretting in the loss of details, only.) I went to see the movie with two friends of mine as part of an early birthday celebration and it was a delightful evening. I rather strongly recommend seeing it if you have the slightest desire to! I think you'll enjoy it. If you like the book, I think it's very safe to say you'll like the movie. It is deserving of the acclaim it is receiving and I wouldn't mind seeing it again sometime. Nor would I mind re-reading the book for that matter! Both were quite engaging and I'm glad to know them both. Yay! So glad to hear your thoughts!!! I did enjoy the book...one of my favorites of the year (though on audio). Though I don't anticipate getting to the theater in the next decade (slight exaggeration) I do want to see this. I'm not sure I want to own it...we don't rent any more...just buy...but I may find it in a red box when it's time...if I can figure them out. I read the book and thoroughly enjoyed it, haven't seen the movie. Usually after reading the book I find the movie disappointing. Glad to hear this one follows the book closely. Glad to hear your thoughts. I loved the book and was a bit nervous about seeing the movie. I went alone as a treat last week and was so pleased that I enjoyed it. I just downloaded the audiobook from our library because I've heard that the audio is very well-done. It's so nice when you walk out of a theater and you aren't dissappointed! I agree, I really enjoyed the book and the movie - and that almost NEVER happens! Great review! I'm so glad you reviewed this book! I've been trying to decide if I should pick it up or not. I have so little time for pleasure reading - I'm glad to know I won't be wasting it! I loved the movie too and thought they stuck as close as they could to the book. I read it last year so I don't think I can even place what your glaring exception is. LOL. Guess I'll have to pull the book out and read it again. This was actually assigned to my son's sophomore language arts class, so I had to buy a copy. I'll have to see if I can snag it from him long enough to read it. I tend to avoid "fad books," too, but like you, I have heard nothing but good about this one. I'll have to put it on my TBR list and keep an eye out for it on Redbox, too. Hey Carrie! This is Heather Carrillo, and I found your blog. Glad I did too. I'm the same way with the "fad" books, but this was one from my Not-Dallas book club. I usually caution people (when asked) about some of the crudities, but other than that I really loved it. I'm glad I read this review too, because I want to see the film, and I am heartened to learn that they didn't destroy it. I also avoid "fad" books. Haven't read Harry Potter or Twilight or The Hunger Games... But I did read this one. It was pretty good! I'm glad you recommended the movie. I'll be renting it via Redbox when it releases on DVD. Thank you for this, Carrie! I have a terrible time seeing books I love up on the screen, and I have been SO reluctant to see this. I just loved the book. In reading your reviews, I've noticed we tend to think alike on some things, so I'm now planning to go!